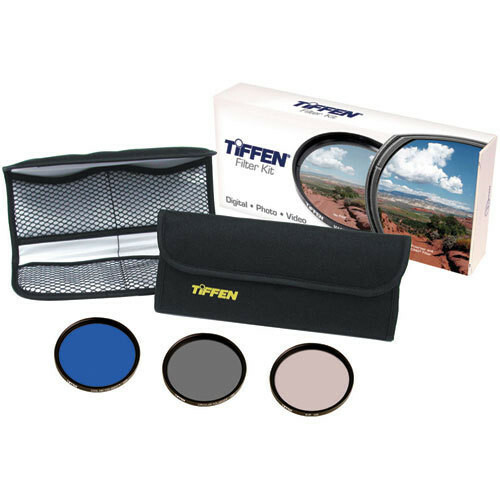 The Tiffen Scene Maker Filter Kit (67mm) is a unique combination of three filters that allows the videographer/filmmaker to create stunning and creative effects. When production costs and schedules don't allow for nighttime shooting, this Day for Night filter can save the day. Rather than adding costly lighting fees to an already over-budgeted project, the Day for Night filter lets you use natural sunlight to create the "nighttime" effect. The Cool Day for Night is based on the perception that moonlight is cool, therefore, bluish in color. To simulate a feeling of moonlight, a specific shade of lavender is used producing visual coolness while maintaining realistic flesh tones. In addition, since the ability to see details at night is diminished by lower light levels, a low contrast component is added to the filter. Tiffen's exclusive 812 puts a little more "yellow" back in the shot. Great for flesh tones in overcast light, this filter balances skin tones in a washed out lighting scenario. This indispensable filter can bump up the blue in clouds, eliminate reflections in glass--and is great for shooting water scenes. The rotating outer ring lets you choose how much contrast you need. These filters were made in the USA and have a solid 10-year warranty. Box Dimensions (LxWxH) 8.75 x 4.1 x 1.6"